The above picture is a snippet of the books on my TBR; TBR being to be read and often referred by me as my unread shelf. In my mind, TBR refers to the books that we own but have yet to read - books that are to be read - however, I've come to realise that that isn't the case for all of us within the book community. As well as being unread books, TBR also seems to refer to the books people are hoping to read in the future - what I deem to be my wishlist. I know everyone has their own opinions and perspectives on things, here in the book community and further afield, so it's understandable that TBR means different things for different people, but boy can it be confusing! When I had the idea to write this post, I didn't make any jottings other than the title so I'm not entirely sure where I was going with this one. I think I kind of just wanted to address my thoughts and see how others view the term TBR - what does it mean to you? What books do you include on your TBR? When referring to your TBR, is that just the books you own but haven't read, or also books you hope to read in the future? Perhaps TBR has an entirely different meaning to you all together! Whatever your thoughts on the subject may be, let's get chatting in the comments below! For me, my TBR list (on Goodreads), is for only the books I own and haven't read. Both eBook & hard copy. I don't add a book to my TBR unless I own a copy. I do have a 'waiting-on-release' shelf on Goodreads that helps me keep an eye out for future books I'm interested in. I only add it to my TBR when I get a copy or I remove it completely. I try to clean up my TBR list about twice a year because it gets way too overwhelming, and I know I'll never read them all! TBR's, whatever capacity you use them in, can definitely get overwhelming! It sounds like we have a similar system in terms of usage of TBR as well as how we keep it in check... Although I have yet to add my eBooks to my Goodreads TBR - I so rarely read on my Kindle these days, but it is something I'm trying to get back in to so I shall have to get to that! My TBR on Goodreads is all of the books I want to read at some point. But I also great a monthly TBR list on my blog, and those are the books I'm actually planning to read in the month. It's helpful for reserving books from the library and planning my reviews. I definitely see the benefits of keeping all the books you hope to read on your TBR - it's probably a lot easier having them in the one place! Monthly TBR's are always interesting to have a read of, and I imagine it's a great organisation tool for bloggers who read and review a fair number of books each month. I tend to make a tentative TBR for myself each month with a stack of books on my shelf, but being a mood reader that often changes! I feel that TBR should typically indicate the books-that-we-own-and-haven't-yet-read. But I myself don't adhere to that rule. When I mention my TBR - I almost always refer to my Goodreads TBR shelf which is essentially, like you said, a wish list. Many of the books I do own, but that's not the criteria for that shelf. TBR is a funny one, isn't it?! Keeping all your books - owned and hoping to read - in the one place definitely seems to have it's benefits; one of the major ones being keeping everything all in the one place. I can totally see why you, and others, favour this method. Though I once had over 5,000 books in my TBR, I've whittled it down to less than a hundred. Now I give away anything I don't read in a couple of years or if I feel my interest subsiding. Wow - that's quite some whittling down! I'm very much the same in terms of giving away books I have yet to get round to for a while, or where my interest in said book has changed. I did just that recently in fact, downsizing my TBR by a good 10+ books (which is a far bit seen as my TBR isn't that long at all). I don't know. To me, the definition of TBR isn't that complicated. It's just what I own and haven't read yet. I would hate to see this term become overly complicated. Enjoyed your post. I am glad not to feel guilty about having a large stash of TBR's to read. My question is how much is too much? Or how little is too little? That is for the pile of books. I totally agree with you - the abbreviation seems quite self explanatory to me, however I have seen it used in other forms around the book community and that's where the complication lies - when we all have different meanings! Your question regarding the size of a TBR is an interesting one, and I love seeing how all the members of the book community feel differently on that one... As well as how the size of a TBR is relative to the person. When my TBR was reaching 50 I decided I needed to knuckle down and focus on reading some of those books and knocking my TBR down, whereas others would think of 50 as being barely anything! It's a fascinating subject really. Ok, so I have a tbr shelf which is an actual shelf in my house with the books I own but haven't yet read. Then I also have a word document that is way too many pages long that lists all of the books I hope to one day read. Once I do read one of them, I bold it on the page so I know I got to it! I keep my TBR books separate from the rest of my book collection too, with its own dedicated shelf. 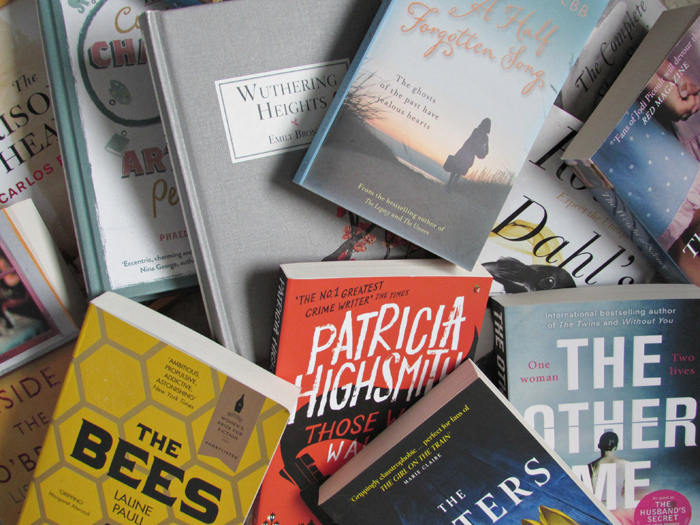 I know many other book bloggers are in favour of keeping all books within their collection together - read and unread - but knowing me I'd probably never get round to reading many of those books... Maybe even thinking I'd read ones that I hadn't! Haha! That's an interesting but straight forward method that you use to keep track of books you hope to read one day - I like it! I typically use TBR to refer to my Goodreads to-read shelf. Some of those books I own, but most I'll end up getting from the library. They're books I heard about in the book world and wanted to make sure I read someday. I'm trying my best to keep that list at about 200 books. See, library books is where it gets a bit iffy on the TBR to me... For now I keep them on my wishlist, but I have books on my wishlist that I know I will borrow and probably never buy, but yet they don't make it to my TBR as I don't own them... Although I know I want to read them at some point. Oh, it's definitely tough keeping book lists (TBR + wishlist) down to a certain number because as book bloggers we are constantly discovering new to us books! I think 200 is a reasonable number though. Haha! I know it can be easy for unread books to get filtered in your book collection as a whole and then 'hide' themselves there! That's why I keep my read and unread books separate now. Extensive library use would definitely make a TBR work a little different... I think the way in which you approach library books on your TBR is how I would too. Haha - yes, it's very hard to keep that number down! I understand how there can be different views of TBR, but at the same time, it's pretty simple. It's books you want to read in some shape or form, right?